In Alex Ross’s collection of his New Yorker articles, Listen to This, he touches on the concept of Alt-classical, the part of the musical landscape where rock, jazz and contemporary classical music come together. You could argue that one of the composers at the apex of this crossover is Nico Muhly, arranging orchestral scores for indie bands on the one hand and critically feted for his original compositions. He leads a gang which seem to cross over on both sides too, his cello soloist tonight Olly Coates who also performs jazz and organises more experimental bills and his previous violin soloist Thomas Gould who performs more like a rock star on stage than a classical soloist. From the other side, he has led more folky performers such as Sam Amidon and Doveman. Although tonight was billed as the European and World premières of pieces by Missy Mazzoli, Owen Pallett and Nico Muhly, this was more like a night with Muhly. First off, Missy Mazzoli’s Violent, Violent Sea sounded quite tame when performed by a chamber orchestra. Though that could also have been due my position in the cheap(er) seats at the front. Owen Pallett‘s first violin concerto was an interesting piece. The first movement started out being fairly tame, and you could just about imagine Owen singing the violin part as one of his songs. The faster movements (movements two and four) were a lot more exciting and the technical skill required was fascinating to watch. By the end of the concerto, Pekka Kuusisto the soloist had lost about half the hairs from his bow. It was a pretty good debut, and it will be intriguing to see where Pallet goes next with this type of composition. However, of the three new pieces, undoubtedly the best was Muhly’s Cello Concerto. Whilst it had the trademark Muhly gloss and swell, it was also the must fully formed and full sounding piece of the three. The only criticism of Muhly’s compositions is that they all seem to end so suddenly, as if he has just been distracted by something else. This was certainly the case for the Cello concerto as well as some of his other arrangements later on in the evening. In another demonstration of the cross over nature of this gang of musicians, the evening finished with an hour of more informal songs and performances without the full orchestra. The highlight of this section was the heartbreaking arrangement of Only Love Can Break Your Heart which emerged from out of nowhere (well, segued from a song by Sam Amidon). Muhly’s involvement was audible in all parts of this performance, sprinkling a glossy sheen and dense, comforting string arrangement. So much so, that when the concert ended it was like emerging from a very cosy duvet. Haven’t had a weekend like this in a while. It started on Thursday, with Chilly Gonzales at Koko, possibly his biggest headlining show in the UK for a while. The trouble with the growing popularity of Chilly Gonzales is that his shows now try to please, mainly performing songs off the most recent album, and losing a bit of the confrontation that made the shows fun in the first place. For example, at his Bloomsbury Ballroom show last year, he was standing on the photographer, spitting at the audience and stomping on the piano with his feet. The show at Koko was a lot more civilised by comparison, but that isn’t necessarily a good thing. It would be good to get a bit of that Chilly-edginess back in the show. At the other extreme end of the musical spectrum, Saturday night was spent at Kings Place, listening to the Aurora Orchestra. The star attraction of the show was to hear a new piece composed by Nico Muhly for a six string electric violin, called Seeing is Believing. It will probably take a few listens for it to sink in, as there is so much packed into the piece that it is hard to recall how one section fitted in with another. However, one thing it does prove is that Muhly can do a lot more than just make things sound pretty. (This was how most of his arrangements have seemed.) The accompanying pieces were interesting too, with Muhly’s beautiful arrangements of two motets by William Byrd, and ending on a chaotic piece by John Adams. From a silly entertainer to a night of contemporary classical music, the only way to end the weekend was for something in between. The Barbican should have made more of the fact that their Marathon Steve Reich weekend was really a marathon. When a show starts at 6pm on a Sunday night, the initial assumption is that they started early so everyone can be off home early for the end of the weekend. Instead, we found ourselves still in the Barbican at six and half hours later (well seven and an half – having got there early to see the free performance by So Percussion.) Still, if nothing else, it was a great bargain for the ticket price. I’ve wanted to see Clapping Music performed live since I first heard about it aged 10, and what better way to see it perform than with Reich himself? It kicked off the evening’s theme in the Reich pieces, complex rhythms shifting against each other, sometimes just seeming like an endless patter and at other times dissonance. Later on, with the performances of the melodic Reich pieces, the same occurred but now with harmonies as well as rhythm. To fill the gaps between the change over, So Percussion also popped up in the bar to play various percussive pieces, including Drumming Part 1. In another setting, it would have been easy to imagine the whole room dancing and raving along to it, such is the narrow divide between the classical and contemporary world. 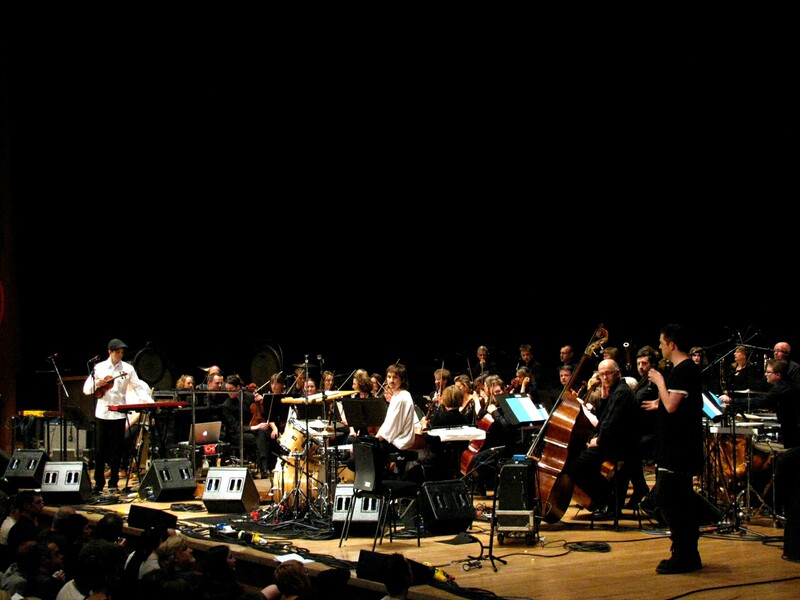 As the theme of the Barbican weekend was music inspired by Steve Reich, the bill also included full-length sets by Owen Pallett, Clogs and Max Richter. Owen Pallett performed a marvellous orchestral version of Heartland. With the Britten Sinfonia at hand, it would have seemed obvious that all the samples and loops could be delegated to the orchestra. Instead, the orchestra was used to double up on the accompaniment with all the usual loops in their normal place. The only issue was the sound, that the band were so loud in the mix that it was a struggle to hear the orchestra at times. Still, when it all got going at full pelt, for example for The Great Elsewhere, it sounded wonderful. Five hours into the bill, after all the excitement of the Reich pieces, Clogs and Max Richter came at the perfect time to round off the evening and calm down proceedings. It was a great way to round off the weekend. Max Richter’s string quintet produced such beautiful textures that if I had a sleeping bag (and they let me) I could have easily settled in for the night in the Barbican auditorium. Nico Muhly and Sam Amidon, originally uploaded by jellybeanz. The last time Owen Pallett played the Union Chapel eight months ago, it was pretty much the ideal gig in the perfect venue. At the time, I thought that the show really couldn’t get that much better. Owen Pallett has set the bar high, and somehow he continues to explore and reinterpret his music in new ways. It wasn’t even that he made it easy for himself, asking Nico Muhly and Sam Amidon to play as last minute special guests. It was great to see Nico and Sam perform in this relaxed environment, after watching Nico Muhly’s programmed show last night at the Roundhouse with the Britten Sinfonia. Whereas last night, it was all about grand arrangements and drama, with just the two of them, it was much more playful. It was an extra treat to see Beth Orton guest with them again, and performing different songs to the night before. Having Nico Muhly on before Owen Pallett was a great opportunity to compare the two. Having not really noticed it before until these two performance, there are so many similarities between their arrangements. Both are never happy with just writing quiet harmonies, instead opting to add little flourishes everywhere in their music. There’s no other way to say it, but both their music is just very pretty. The last two times Owen Pallett performed alone (with a projectionist) with the focus entirely on him and his looping pedals. Before the show, I was a little uncertain how it would work with an additional musician. In fact, it was great to see that Owen could work off another musician, filling out the songs with percussion and whistling. Now, instead of just watching to see how he loops and cues up sections of his songs (which he still does) it’s also a chance to focus on his technique. Until tonight, I’ve never noticed how fast he plucked his violin. 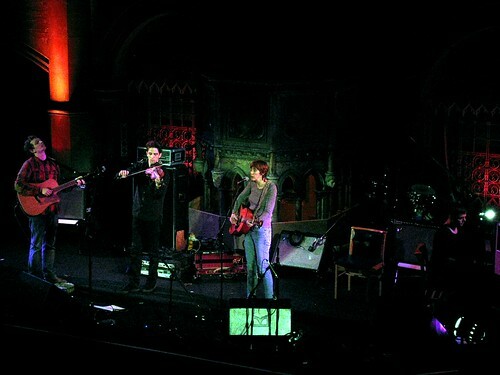 It’s a shame that with the attention that signing to Domino and the release of Heartland that it is likely that Owen Pallett might never play somewhere like the Union Chapel again (the next show is going to be at Koko). There is something about that octagonal, domed room that really suits music like this.